It’s almost exactly year since I started this blog. My first post was dedicated to ‘Women in Geoscience’ Day 2012, followed by a dozen or so others, but I haven’t been very productive lately: my last post was 5 months ago. There is an explanation, of course, but it’s not very interesting. Today is – again – Women in Geoscience day. What better day to crank my blog-effort up again? Even better for inspiration: Andrew Alden (@aboutgeology) mentioned my writings in his ‘women in geosciences’ blog post today (http://geology.about.com/b/2013/10/17/women-in-the-geosciences-day.htm). Wow! Me? Really? Goodness. So here is today’s essay on Women in Geoscience. And I am going to guess that what I sketch here pertains to women in science in general, and possibly to women in anything else. In the 1980s I worked in the coastal geology program of the Louisiana Geological Survey. Having grown up and studied geology (BSc) and Quaternary Geology (MSc) in the Netherlands, Louisiana was perhaps a logical destination (an Italian woman geologist friend said to me at the time of my move to the Deep South: “these Dutch people, they can’t stay away from flat delta plains”). There were about 7 of us, all contracted to provide the Government and the People of Louisiana with evidence-based advice on what to do about their rapidly disappearing delta plain (it’s still disappearing, by the way, but this post is not about governance). Incidentally, most of us were able to produce a PhD on the basis of our research, made possible by good personnel management of the LGS, but that’s another story. 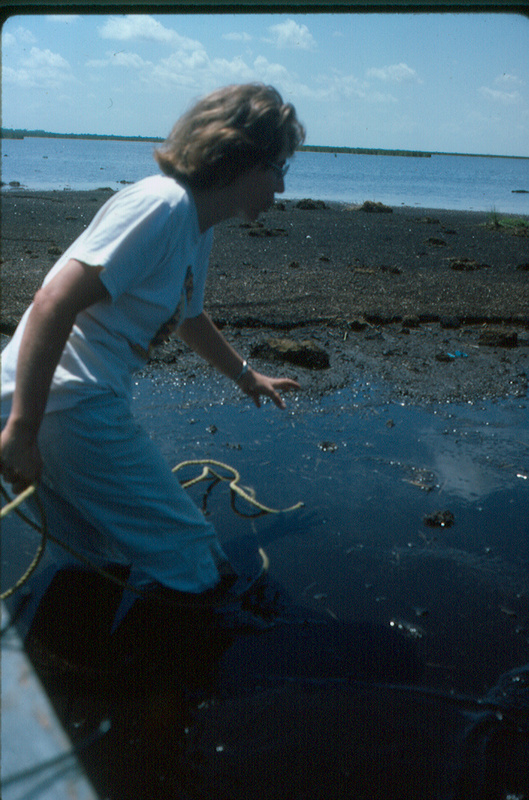 Each of us (only 1 other woman) was responsible for research in specific areas of the delta: the offshore, the barrier islands, the river and – in my case – the peat deposits of the delta plain. Peat: black, gooey stuff, minimally decayed plant material mixed in with fine sediment. I treated peat as sediment – I am not a biologist, after all. But I was lucky to meet a very capable marsh expert / ecologist outside the Survey and she and I ended up collaborating productively for a few years. I learned a lot about plants, ecology and marsh dynamics. Skip forward about three years: by now I had published papers, given talks at conferences and built up a bit of a network. Much to my surprise, my work was discovered by coal geologists who were interested in how peat could get preserved in deltaic settings (where we find a lot of the world’s coal seams). But I also ended up at wetland conferences where I would be the lone earth scientist among ecologists and biologists. In short, I found myself at an interface between earth and life sciences. Because I was young and in a new country where I did not always feel very secure, this position didn’t necessarily feel comfortable. What was I? Would I still be taken serious as an earth scientist if I worked any longer on peat? Shouldn’t I try to leave and make an effort to become a ‘real geologist’? What was that anyway? One evening I found myself sitting at a restaurant table with 3 other peat/coal women scientists: one was my ecologist/marsh expert colleague (and by now friend), two were classically trained coal geologists whose research had taken them into looking at modern coal-forming environments, i.e. peats. Mind you, this is 1987, the number of women geoscientists was a lot lower than it is today. We got a little giddy: there were four of us! Four women researching peats as modern coal analogues. And we knew of exactly one other person with the same research focus: another woman. Serendipity? Just chance? Or would there be a reason? A few glasses of wine and some deep discussion later, we arrived at a hypothesis: most male mammals, including homo sapiens, are territorial. They mark their territory diligently, making sure to smell out their competitors. Jump forward to practicing science: do male scientists instinctively claim a territory in which they can make their mark? A clearly defined subject, one that is recognized by other male scientists as a properly outlined dueling target? A delta consists of sandy framework facies – many textbooks and libraries have been written about the sedimentology of river and barrier island strata, but what to do with peat? It’s neither this nor that – it’s plant material, but becomes preserved as strata. That’s messy, that’s not a clear territory – let’s leave that for the girls. If this dynamic does really work (often), then I really don’t blame the boys, it’s not a conscious decision and they can’t help it anyway. Only 2 days after publishing this post, I was made aware of an article by Curt Rice (@curtrice on curt-rice.com) entitled “The great citation hoax: proof that women are worse researchers than men”. It’s devastating analysis of how male scientists tend to cite themselves and other male scientists exponentially more and more often than female scientists. I feel strangely relieved because this supports something that I suspected a long time and that I had intuitively parked under the same ‘territorial behaviour’ label. This entry was posted in Women in geoscience and tagged earth science, STEM, women. Bookmark the permalink.